Welcome to Three Word Thursday #53. Please join us in our weekly romp as we try to rescue lost and forgotten words from the dusty halls of antiquity. If you enjoy reading my story, leave a comment then click on the names of the other players and go see how they used these bygone words. You’ll be entertained (and possibly educated) all at once. This is my story. All the other players posted theirs last week. I have added the Mr. Linky below in case you didn’t all visit one another. Enjoy! imbroglio: n. an intricate and perplexing state of affairs; a complicated or difficult situation. If only my life wasn’t such an imbroglio right now. I would welcome a tantivy conclusion to My Fair Lady and the upheaval of my household schedule. I have been dashing about this morning getting things ready for Amoeba (he is giving a botany final to his students), and soon I have to deliver supplies to the theater, pick Amoeba up from work — enjoy a lovely meal out together — then present our selves at the playhouse 2 hours before curtain. We’ll probably not be home until late tonight, about an hour after the curtain falls. I have 12 writing pieces needing my attention and all of your blogs to read. Dearest Thom tells me not to try to catch up, but I will do my best to post a Strawberry Fife episode for you tomorrow. In the meantime, I will not put you on my list of delenda, but I must once again ask your indulgence. If you wrote a 3WT today, please sign in. I agree with Thom, and I was thinking of offering similar advice under your long post about how things are growing frantic. Blogging shouldn’t be a must when you’re already stressed for time. I don’t think it should even be a should when you’re stressed. I know Doug, but you aren’t getting the emails from people who are upset at all the things I am missing. And just to clarify, I look forward to your posts, particularly the Strawberry Fief ones, but I’m happy to keep looking forward to them until things settle down. Doug — thank you. I will try not to make you wait too long. I will be at the theater early tonight. I will take my laptop and see if I can’t get some writing done. I may not blog, but with luck I can write an episode or two of Strawberry Fife. See that’s just what I wouldn’t do. Blogging can be very codependent, which is fine when you’re bored but I’d err the other way right now if I were you. I’m first! I’m first! I’m NEVER first! Q – it is quite alright for you to take time to breathe. Inhale. Exhale. Kick Amoeba out of car. Inhale. Exhale. Attend performance. Inhale. Exhale. You get the idea — and there’s no computer in the middle of that. We’ll survive. And it’s a credit to 3WT and Strawberry Fife that your readers are clamoring and e-mailing. Kelley — right now it feels more like pressure than praise. However, crunch time should lighten up soon. Imbroglio…always one of my favorite words. Also, ubiquitous! Melissa — so, you’ll be joining 3WT? Yes? Ahh, I was just coming in here to post what Melissa already wrote! Kala — I know it isn’t a totally forgotten word yet, but it is on the endangered list. I want to give it a revival! 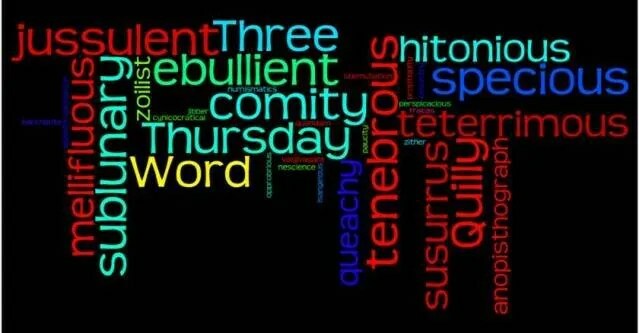 Well that was an excellent Three Word Thursday. As I said in an email Q just start from now. And with all the emails if people don’t get it oh well. They will live trust me. It’s just a blog, it isn’t that important like other things that tend to need and demand one’s time also. And if they don’t get it…just do what I do…tell ’em BITE ME!!!! ROFLMAO. I think you are taking all of this far to seriously about having to be right up and caught up to date. You need a reality check and you need to put this blog into perspective. When blogging causes you this much stress it isn’t worth it. It’s suppose to be fun. A hobby. Not something that MUST and NEEDS to be done. But knowing you you aren’t going to let it go and you are going to stress over this forever and a day. So I’m just going to say suit yourself. You gotta do what you gotta do and no one is going to talk you into anything you don’t want to do. Thom — have I told you lately that I love you? well, as far as i’m concerned,this is a perfectly valid TWT and well written at that.